Leo Carillo State Beach and Point Magu S.B. Program operate during summer months. Program operates out of Refugio State Beach. Lifeguards rescue a hapless dog that was trapped in a cove near Gaviota SB. summer months. Call for information on tower locates and schedules. summer weekends. Call for tower locations and schedules. along the O’Neil Forebay. Call for tower locations and schedules. Lifeguard being "hot dropped" to a rescue on San Luis Reservoir. between Memorial Day and Labor Day. staff provide vessel patrol and response on Perris Lake. provides aquatic safety education during the summer. during summer months at designated swim beaches. Call for tower locations and schedules. Vessel patrol of Lake Oroville State Recreation Area by State Park Rangers. along the Ocean Dunes SVRA and Pismo State Beach. Extensive lifeguard service is provided along these popular beaches located in Orange County. Permanent lifeguards patrol the State operated beaches and parks year-round. During busy holidays and through the summer months numerous seasonal towers and patrols augment the lifeguard service. Call for tower locations and schedules. Junior Lifeguard Programs provide aquatic safety education at San Clemente and Huntington State Beaches. Main Office Address: 2680 Carlsbad Blvd. lifeguards, year-round service is provided on these popular beaches. fitness for the youth in the area. safety education and fitness training to the youth in the area. Sunset State Beaches are opened primarily during summer months. Lifeguard at Twin Lakes SB swims out for a victim struggling in a rip current. out of Half Moon Bay State Beach. Location: The park is located 5 miles north of St. Helena and 4 miles south of Calistoga on Highway 29/128. Description: Located in the heart of the beautiful Napa Valley wine country, the Bothe-Napa Valley State Park offers camping, picnicking, swimming, and hiking trails that go through stands of coastal redwoods as well as forests of Douglas-fir, tanoak, and madrone. 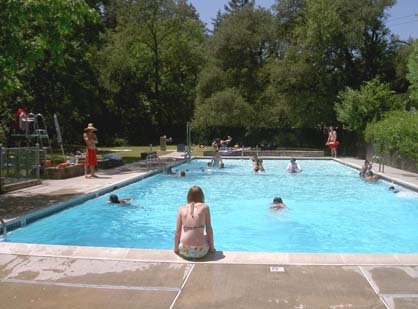 On hot summer days, grab a swimsuit and towel and come enjoy a dip in the park's swimming pool which is open on weekends, beginning on Memorial Day weekend through mid-June, then daily through Labor Day, from 12- 6 p.m. There is an additional fee for the use of the swimming pool, to be paid at the park entrance. 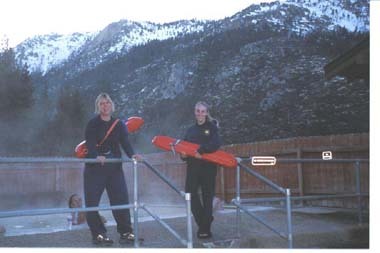 Description of Service: Two full-time pool lifeguards, assisted by a seasonal staff, provide year-round service at this natural hot spring fed pool which is kept at approximately 102 - 104 degrees with a bromine additive for disinfecting purposes. A larger, cold water chlorine swimming pool is kept at 75-80 degrees. Rental of swim suits and towels is available should you forget. A great place for a soak after a day of skiing or hiking! Try to remain calm. Have someone spot the person in trouble or keep your eyes on the person. Give a clear explanation of your location and stay on the line with the dispatcher until you are told otherwise. 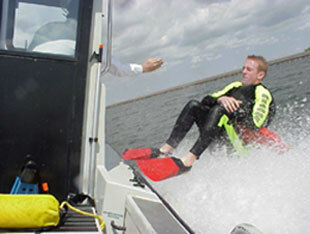 Only professionally trained rescuers should attempt in-water rescues.